Autodesk did a bang up good job on the enhancements to its manufacturing product line. Autodesk Inventor 2015 received a lot of important attention. Following up with our recent “What’s New in Inventor 2015” and “Free Your Forms” posts, we continue our deep dive series with some detail on the Sheet Metal enhancements. Punches are now applied ‘across bends’. This is a bit misleading, as the punches are really wrapped around the bend. Inventor appears to accomplish this by applying the punch to the flat pattern in the background. This becomes evident when viewing the flat pattern and find the punch geometry shape laid out across the bend there. This feature is helpful when you need to make punches at a location in the flat sheet before fabrication, but not after. Areas where manufacturers need the ability to press or punch a shape after forming will have to wait a little longer for that functionality. Inventor’s default behavior is to apply the punch to any points within a visible 2D sketch. The interface waits for the user after selecting the defaults. Windowing the sketch will remove the default selection and pick any point as well as sketch geometry endpoints that are within the window. The Cut Normal option is added to the Cut dialog. This option projects selected profiles onto the sheet surface and then cuts perpendicular thereto. In the image above you can see the difference between Cut Normal on right and Cut Across Bend on the left. Each sketched rectangle is 1.0 units tall. The Cut Across Bend is applied directly to the unbent sheet and then bent; it measures 1.0 units tall in the Flat Pattern. The Cut Normal projects the sketch to the bent sheet face, and then cuts perpendicular through the sheet. The sketch plane angle is 45°; In the Flat Pattern, this feature measures 1.343 units tall. The catch here is that Inventor projects to the inside of the bend (opposite of the sketch) and then cuts outward. This appears to enforces the ability for a 1.0 unit tall object to pass through the cut. 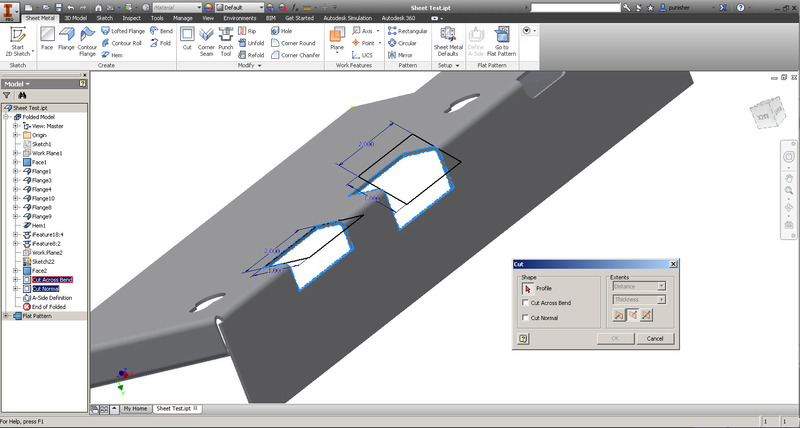 Inventor now allows users to define the A-Side of a sheet metal part. This command permits the sheet metal component to control the punch direction. Inventor’s new functionality insists that an A-side be selected once the Flat Pattern has been generated. The Flat Pattern command will select an A-Side if users do not. Once selected, the A-side can be changed or deleted, but only by deleting the Flat Pattern feature first. Unfold/Refold command allows selection of zero radius bends and flatten zero radius bends when a flat pattern is created. A new face is added to accommodate the Unfold operation based on the user defined K-Factor. After Refolding these references remain.